Hey. I started this forum so you can talk about the other Tekken characters that you like that are getting deprived of attention due to this website (no offence of course). You can also post combo's that you know of that character if you want. Personally, my other faves would have to be Hwoarang and Devil Jin (obviously). There you go. X X X X, 0 0 0 0. That's a nice combo for Hwoarang. I'm no combo master, mainly because I don't even remember the order of X, Circle, Square and Triangle in the controller. I don't look at the controller during gameplay, I merely think that when I press the two middle buttons and down at the same time, I'mma loose the match. down/front triangle, down/front+ triangle, back(hold)+ square, square, square, square, square, back+square, front+cross. "Combo" is a set of moves where if first one connects, all the following are guaranteed (can't be blocked). 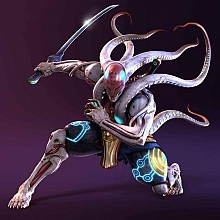 Apart from Yoshimitsu, I also learn Wang because of he's parrying abilities. 2nd fave = w00t go DV JIN he's cool. deviljin_5 : Hey. I started this forum so you can talk about the other Tekken characters that you like that are getting deprived of attention due to this website (no offence of course). You can also post combo's that you know of that character if you want. Personally, my other faves would have to be Hwoarang and Devil Jin (obviously). There you go. X X X X, 0 0 0 0. That's a nice combo for Hwoarang. 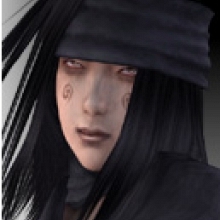 Afta Yoshi (of-cors), my secind fayv wud be Raven cause he'z a ninja, and y wudn't a ninja b un-cool? Afta that Im pretty average with the rest. I cnt baleave yu kogamitsu's; bryan..
A request to you, clar380; you could use more proper english in here. I believe I'm one of many who have difficulties in understanding your writing. Okay then. I'll start writting proper english, but I must say the english language is horrible. If you go to england you'll be suprised to know that they speak english but you won't understand them. They've bastardized the language so much that it sounds more like they have a bad case of the hiccups or something. And - of course - english has soo many words that come from other languages in it that it doesn't resemble the language it was fifty years ago so I have a right, as a humaan, to write the way it sounds. (Kogamitsu, don't be mad, I have too much pride as it is). Um a combo... Basic uppercut, 1 stone fist, one normal left punch, 1 stone fist and a woodcutter. It should work out to be a six hit combo, not that strong but it looks cool and is hard to pull off. Anything after that is too hard for me to pull off. Circle + X is also a nice move.